LUCY BURDETTE: We’re all amazed when What We’re Writing Week swings back around faster than the Key West Cat Man’s menagerie can jump through a flaming hoop. After I describe what I’ve been up to, you might wonder that I’ve written anything in the last two months. As you know by now, DEATH WITH ALL THE TRIMMINGS will be published on December 2. (Pre-order link right here!) The modern way to publicize a new book, especially a cozy mystery, seems to be the blog tour. 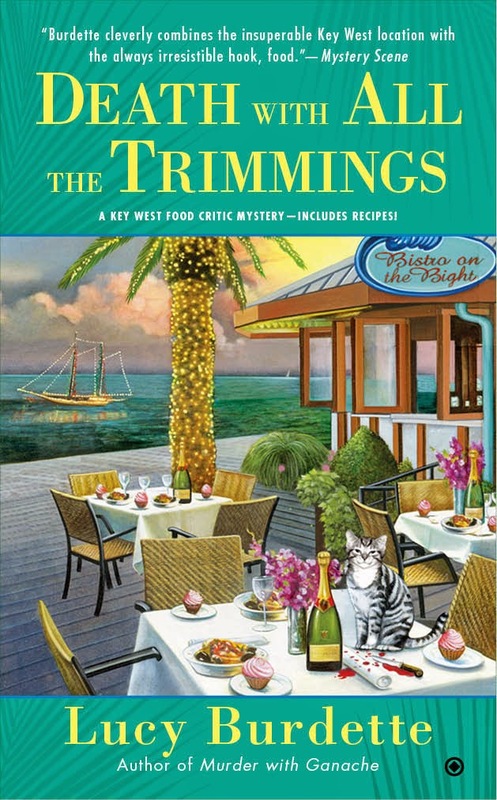 So I’ve been writing blogs—lots of them—about Christmas in Key West, writing a foodie character, why I love cozy mysteries, and a day in the life of Hayley Snow, just to name a few. Three of us Reds also had a fantastic long weekend at the New England Crimebake, a conference founded to celebrate crime fiction, especially from New England. I had the honor of co-teaching a class with agent John Talbot on writing and selling the mystery series, doing manuscript critiques for aspiring writers, and attending many wonderful panels. We all enjoyed the folksy humor and good nature of our guest of honor, Craig Johnson. A noisy rustling burst out in the audience and the man with the palm frond hat staggered up toward the podium, shouting. “You people have been looking for any excuse to take over. Damn it, this is none of your business! The trouble with the Artistic Damn Preservation Society is right here in this room.” He spun around to point a shaky finger at a tall man several rows behind me: my friend, the tarot card reader. Lorenzo. “You need to sit down or you’ll be removed from the premises,” said Commissioner Greenleigh. But the palm hat man darted down the center aisle, heading for Lorenzo. He flung himself across two startled women and circled his hands around my friend’s neck. Lieutenant Torrence and a uniformed cop yanked him off Lorenzo, whipped his hands behind his back, and cuffed them. He fought and cursed as they ushered him out of the room and down the stairs. “Are you all right, sir?” the mayor asked Lorenzo. “I think so.” Pulling a white handkerchief from his pants pocket, he patted his face and neck, now mottled red, and smoothed his hair. “If you’re able to speak, sir, it’s your turn at the microphone,” said the mayor. Lorenzo nodded, adjusted his collar, and came forward. By dress alone, he stood out from most everyone in attendance: long-sleeved white shirt, high-waisted black pants, black tie. All very proper and distinguished. But his face shone in the spotlight and large damp circles spread from his underarms to the body of his shirt. He looked very hot. And rattled. 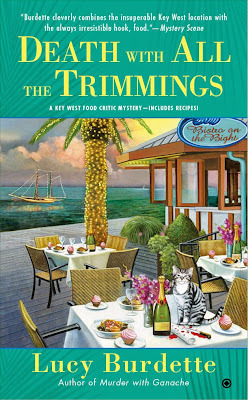 Burdette infuses the mystery with Key West spirit and holiday fun along with delicious food references and recipes. This strong series continues a unique blend of island mayhem and sparkling characters surrounding a layered mystery. Fans of Julie Hyzy and Laura Childs may also enjoy. Love the Booklist review . . . congratulations! Enjoyed seeing the Crimebake pictures; thanks for sharing them. I'm looking forward to reading Fatal Reservations, even more so now that I've read this excerpt . . . .
Congrats on the great review. Looking forward to digging into the book myself in the next couple of weeks. Hearty congrats on the Booklist review! Thanks so much you guys! Before a book launches is such a crazy time--a review like that one makes it all feel worthwhile! Wish we'd gotten a picture of you dancing! She's got the moves, folks. What a great Booklist review! And on the money. This book sounds like fun. I hope you have a fun launch and a good time getting the word out about it. It was great to see you at Crimebake. I don't want to hurry through Thanksgiving, but what a great treat in store!! And you have totally captured my interest with the snippet from #6! Write on, Lucy. Congratulations on the great Booklist review, Lucy. The review was right on target with its praise for the ambiance of the island that the books exude and the fascinating characters, main ones and others. Death with All the Trimmings is on deck waiting for me to finish my current book. Thrilled with receiving an ARC, I will go and do a pre-order, too, because I want that wonderful cover to go with my other Haley Snow covers. Your friendship with Lorenzo/Ron led me to sit down with him for a tarot reading when I visited Key West in September. I, of course, mentioned you, Lucy, and how much I loved your novels and his appearance in them. I'm very much looking forward to Fatal Reservations. Loved the picture of you and Ron, and the excerpt was great. I agree that Ron tends to stand out. I also enjoyed the pictures of you and others (Hank and the Hanging Judge was priceless) at Crime Bake. I so wish I were attending Bouchercon this year to see what the Reds come up with for their panel. Have fun! Great review, Lucy!! And can't wait to read Trimmings. I think you've hit the secret of making amateur sleuth mysteries work--the sleuth has to have a personal stake. I usually try to give my professional detectives a personal stake in solving the crime, too. and I don;t need to imagine you dancing..I saw you at CrimeBake in that adorable skirt!